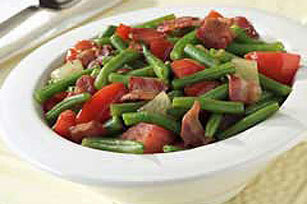 Note: our Skillet Green Beans with Bacon & Tomatoes may outshine the entrée. Plum tomatoes add a juicy pop right at the end to tie everything together. Cook bacon in large skillet on medium heat until crisp, stirring occasionally. Transfer bacon with slotted spoon to paper towels to drain, reserving drippings in skillet. Add onions to drippings in skillet; cook and stir 6 min. or until lightly browned. Add beans, broth and pepper; mix well. Bring to boil. Reduce heat to medium-low; cover. Simmer 40 min. or until beans are tender. Stir in tomatoes; increase heat to medium-high. Cook 3 min. or until tomatoes are heated through. Transfer to serving dish. Sprinkle with bacon. Serve warm. Select fresh green beans that have firm, smooth, brightly colored pods. They should be crisp enough to snap when bent in half.